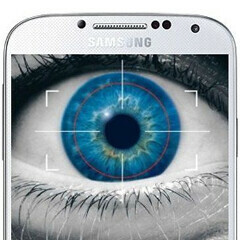 Samsung to feature iris scanners on its mobile devices – and it's sooner than you may think! SRI (Stanford Research Institute) International is a nonprofit research institute and one of the largest ones in the world at that. Established in 1946, it is based in the US and is said to have brought regional economic development as well as many innovations to various scientific fields (from medicine to tech) through the years. Why do we talk about it, you may ask. Well, SRI has developed a range of biometric systems it calls Iris on the Move (IOM) and, as the name suggests, they work as portable iris scanning gizmos. Today, the company has announced it has given Samsung an exclusive license to the tech to use in mobile products, and the report claims we may see the first device to come from this alliance fairly soon! According to the press release, the very first Sammy product to feature the iris scanning tech is a modified Samsung Galaxy Tab PRO 8.4. The gizmo will be showcased at this year's ISC West in Las Vegas, on April the 17th and will, in fact, be sold worldwide through "SRI partners and resellers ". We'd imagine it would be a limited edition test device for businesses, but hey – who knows. Now, it seems that the IOM tech in Sammy's tablet is to be used as an identity authentication tool to be used by regulation personnel, rather than a device lock/unlock mechanism. However, it could be a step towards replacing the fingerprint sensor with a much more accurate, and harder to cheat, iris scanner. After all, it has been rumored that Samsung is looking into the technology before, though, back then, the company had to give up on its plans due to issues with practical implementation of the tech. Wondering how an iris scanner on a mobile phone might work? Check out our hands-on with Fujitsu's solution from this year's MWC! Lumia Flagship has this feature coming if I'm not mistaken. Wow, that's a lot faster than I expected. I'm also really surprised that it can detect the small patters of the iris at that distance. I was expecting to have to hold the phone up to your face, maybe 3-5 inches away. However, I'm still more interested in the 3d ultrasonic fingerprint technology that the Snapdragon 820 will supposedly have where it will detect a fingerprint by touching basically anywhere on the phone by ultrasonic waves that detect your 3D fingerprint through many materials, including glass, metal and plastic. That way you don't need to look at your phone or grab it any certain way, just touch it somewhere. This on the Note 5 would be a huge plus. Innovation driven by Samsung. I would NOT call this a gimmick. And if no issues arise and it works as fast as the video I'd see finger print scanners bypassed quickly. I feel I have just a portion of damaging info on my phone if lost or stolen, I'm sure others have much more. In saying that the quick easy scanning of the iPhone 6 made it an easy sale for me. I'd feel better if Apple used the Iris tech first as I'd feel more confident it was more thoroughly tested, but Samsung impresses me enough I'd even buy thier product also. "SRI (Stanford Research Institute) International is a nonprofit research institute and one of the largest ones in the world at that." -PA (Paul K.) At that? At that what? huh? What language are you writing in? As usual, feature to not use.